Only if Jesus is a liar! To start with, if you are saved you are one of Jesus sheep. This is what Jesus says about his sheep: “I KNOW them” (John 10:27). In 2 Timothy 2:19, the Word of God says, “The Lord KNOWETH them that are his”. It is not possible to twist this into saying that never doesn’t really mean never but that at judgement day, it will be AS IF God never knew them. The BIBLE doesn’t say AS IF and the word doesn't mean AS IF. This verse does not say, it will be AS IF God never knew them. The fact is that those whom God eternally damns on the day of judgement will never ever at any time have been known by Jesus as HIS sheep. Never! The same Greek word translated in Matthew 7:23 as"never" is the same Greek word used when it says in Hebrews 10:11,"And every priest standeth daily ministering and offering often times the same sacrifices, which can NEVER take away sins:"
Never, never means anything else but never, Never! If you look more closely at John 10:27-30 this is emphasized in 7 different ways. Jesus tells us that his sheep are…. 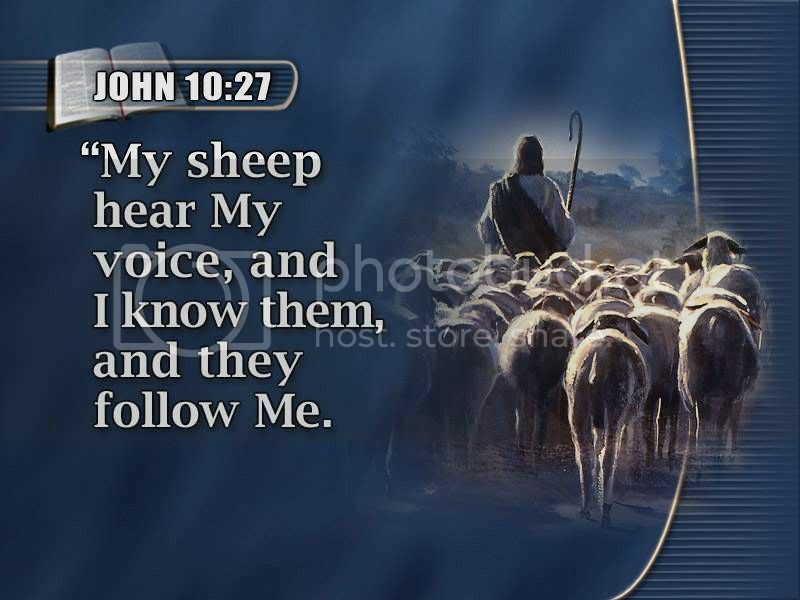 It is natural that Jesus' sheep will continue to follow him (though they stumble at times) because, they are Jesus Sheep! Those who are not Jesus sheep do not follow him. From these two passages we can see that Jeus has made two very clear statements on who will perish and who will not. Unlike Jesus sheep, those who perish are those who were NEVER known by Jesus (Matthew 7:23). To assert anything different is to make Jesus out to be a liar. As well as this, when it says in John 10:28, “they shall NEVER perish”. The word translated “never” is a double negativein the Greek. In English, a double negative makes a positive. But in the Greek, a double negative emphasizes the negative. So it can be read, “They shall never, no never perish”. If you are saved by grace and through faith (Ephesians 2:8-9) you can NEVER lose your salvation. If you perish on the day of judgement, you were NEVER saved! Any other passage in Scripture, that seems like it implies a person can lose their salvation must be interpreted in light of the clear and uncompromising words of Jesus Christ as found the gospels. To claim that you can lose your salvation, you must be able to prove that when Jesus said NOT and NEVER, in John 10:27-30 and Matthew 7:23, he actually meant something else. It will not do to go rushing off to some other passage in Scripture, you must prove that when Jesus said NEVER, in these verses, He NEVER actually mean it. Praise God that Jesus keeps his promise to keep his sheep. If you are truly saved and have become Jesus sheep, then according to Jesus, you shall NEVER lose your salvation! So the question to ask now is not, "Can you lose your salvation?" but it won't hurt to ask, "Are you really saved?" (2 Corinthians 13:5). CLICK HERE to be sure.